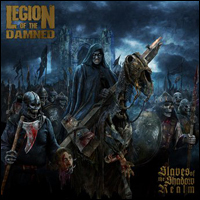 Slaves Of The Shadow Realm by Legion of the Damned starts the year off with a solid eleven tracks. Slaves of the Shadow Realm is the band’s eighth album since changing their name from Occult to Legion of the Damned thirteen years ago. It will be the band’s thirteenth album overall. Few bands capture the essence of a riff-driven thrash like the Dutch quartet Legion of the Damned do here allied with the aggressiveness, bombastic elements, and instrumental prowess any metal fan could ask for and receive.